This little project is super simple and will only take about an hour or so to put together. Totally depends on how many ribbons you add for details and how fast you can tie a knot! I had all these things in my stash. The metal ring is 16" in diameter and was from an old macrame hanger my Grandma used. I cut the old yarn off and kept the ring, knowing I would use it someday for something. You can find metal rings at JoAnns, or do a google search - you will find many options, all very inexpensive. You can get whatever diameter you want. 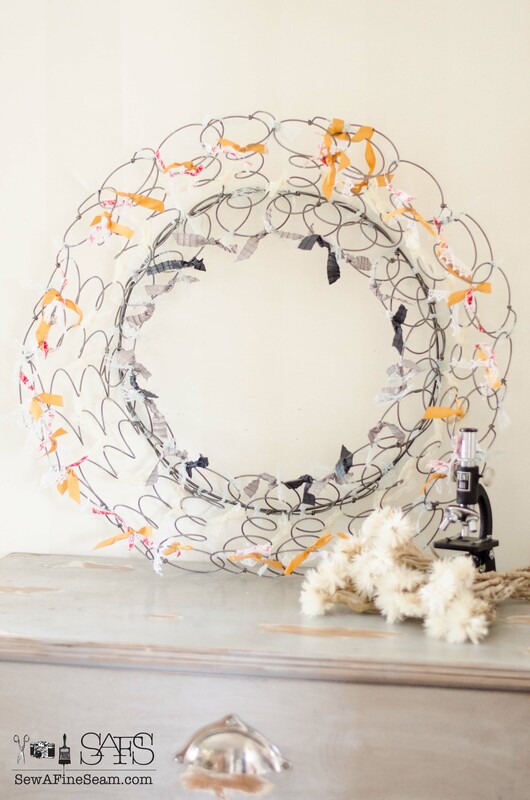 The larger the diameter the more springs it will take for your wreath. My springs, as I already said, came from an old boxspring. Don't throw those out! Deconstruct them and use the springs! 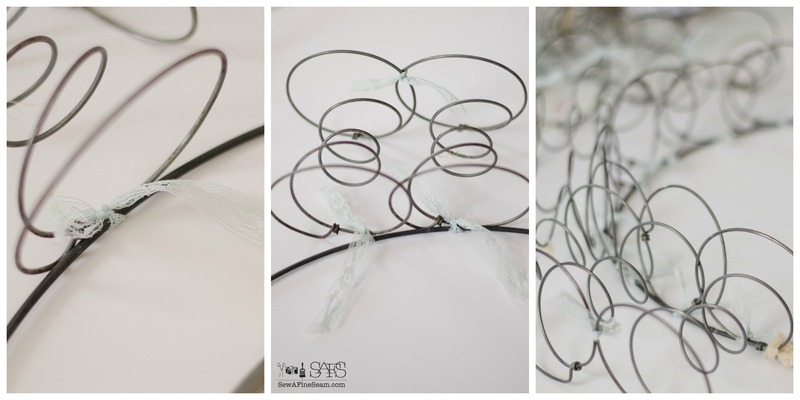 Pinterest is a great place to find ideas for what to do with all those old springs. My lace is vintage hem tape that I also had in my stash. 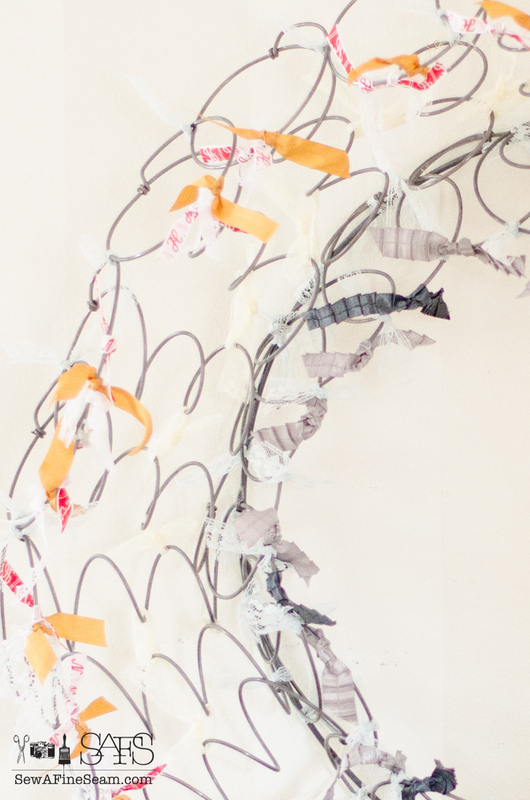 you could use ribbon, twine, or whatever cording you have on hand, or buy whatever you want. 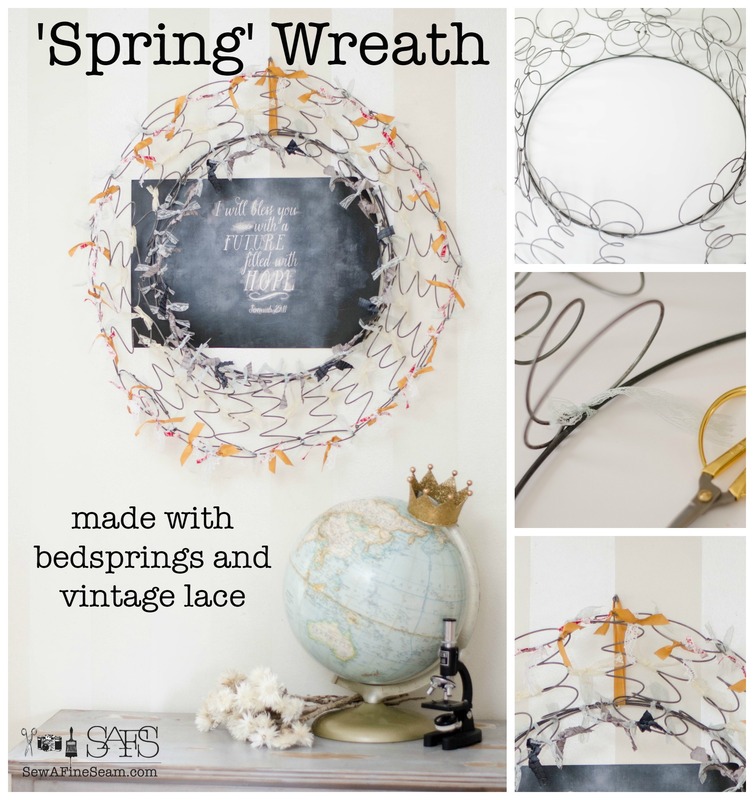 I laid out my springs to get an idea how I was going to go about creating a wreath. Tip - hot glue doesn't work well at all as the dried glue just pops right off the metal. I started by tying a spring to the metal ring using a piece of the vintage lace. Tie a second spring to the metal ring, overlapping the bottoms of the spring enough to bring the tops of the springs together. Tie the two springs together with lace where they touch each other at the top. Continue tying springs to the metal ring and to each other all the way around. To reinforce things a bit, after I was finished tying, I went back and added more ties anywhere the springs touched each other that hadn't already been tied. After tying it all together I added more bits of lace and ribbon all over just to give it a pop of color and a fresh, bright feeling of springtime. All ribbon came from my stash. You can use any colors or types of ribbon or lace to fit your style or color scheme! 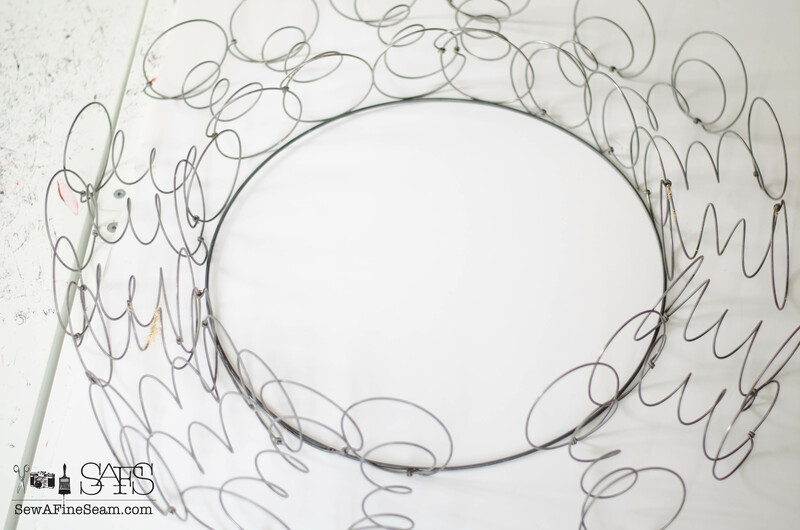 The springs move a bit but it's not hard to keep this looking like a round wreath - especially when hung on the wall. To hang my wreath I used a bit of ribbon that matched some I'd used to detail it. I looped the ribbon around the metal ring and then tied it to the top of the spring. 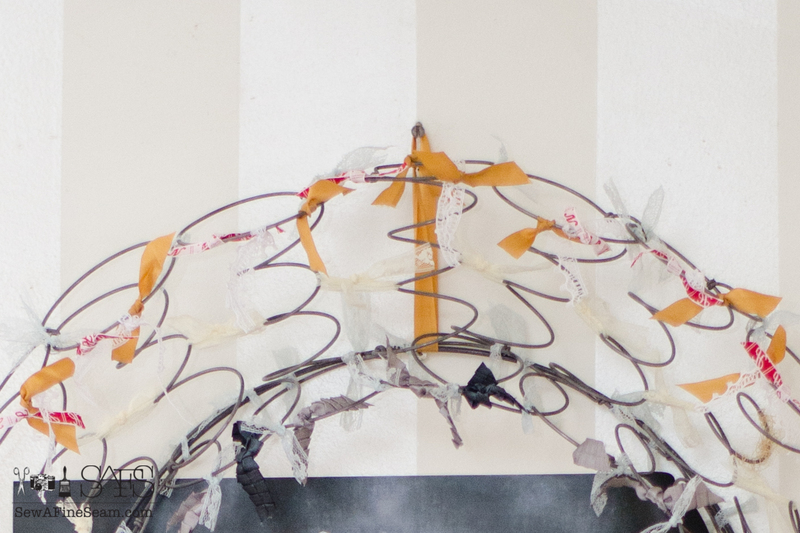 Using the metal ring keeps the wreath round as hanging only from the top of a spring will make the spring stretch as it hangs, and make it look a bit oval. Tying to the spring as well, helped keep the wreath hugging the wall and not leaning forward like it was going to jump down and going 'springing' away. Airy and 'spring-y' and fun! 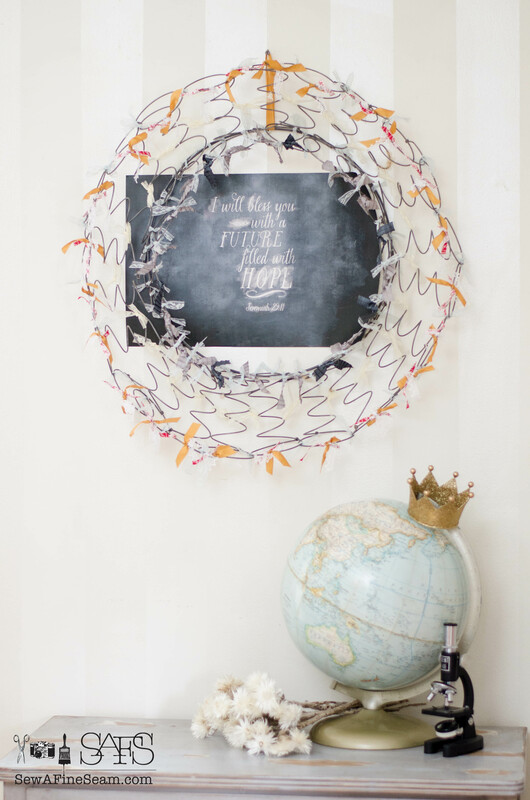 I tucked a chalkboard print behind the wreath for a bit more texture and to make it pop a bit more. Thank you, Kim, for having me over once again! Happy Spring! 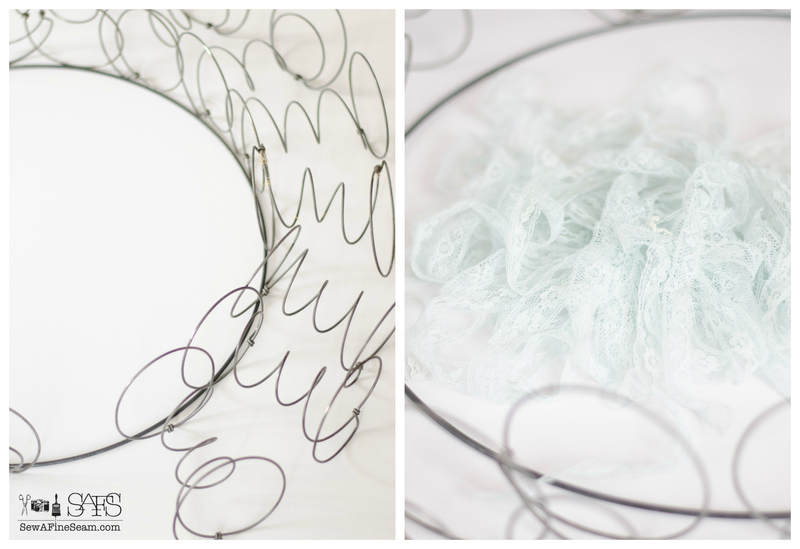 A couple other ways I've used bedsprings can be found here and here.